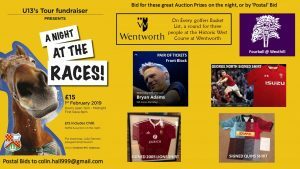 Under 13s Tour Race Night – 1st February 2019 – GET YOUR BIDS IN! Race Night, the fundraising social for the u13 tour to Wales on Friday 1st February is almost sold out, but if you can’t make it, worry not, you can still put in a ‘postal’ bid for any of the great prizes below. Playing at the historic Wentworth West course should be on every dedicated golfers bucket list and, courtesy of Inchora Health, we have a round of Fourball available for three people (the fourth will be a host from Inchora Health). This will be offered in a reverse Auction with the first bidder to ‘blink’ as the cost slowly comes down securing the prize. 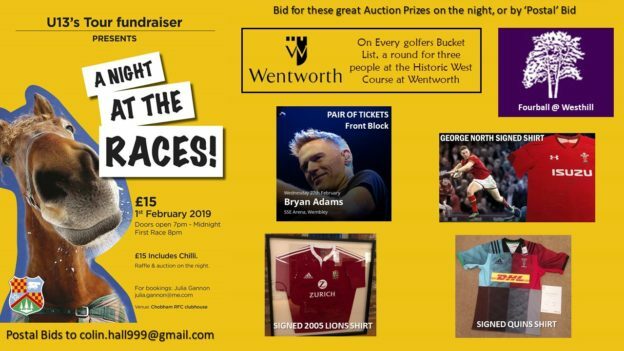 Club together with your golfing mates to get your bids in for what could be a once in a lifetime chance to play at Wentworth. From the controversial 2005 tour of New Zealand we have a framed shirt signed by the entire team. Grab yourself a piece of Rugby History and put your bids in. A must piece of sporting memorabilia for our Welsh (& Welsh Rugby loving) members. A chance for 3 people to play a game of fourball with a Westhill member at one of Surrey’s most challenging and picturesque courses. Team shirt signed by the entire Harlequins team together with a certificate of authentication. COYQ!